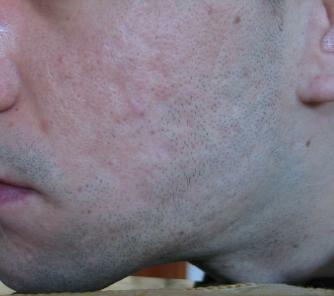 This is after 2 Er: YAG resurfacings (been red for 4 months after each treatment) and two IPLcollagen stimulations. The results are...well 5 % improvement (In my eyes) which is crap. I want to get hypertrophic lesions treated with corticosteroids and atrophic excised. Had one excision on the right side but didn't work out too well, so I'm not showing it here. Any comments about treatments are welcome! A final note: My skin would look bad even without the scars. I just have bad, blotchy, red skin and large pores. Don't know what to do about this. Photo Information for Hypertrophic and atrophic scars. And, i'm not just saying this to make you feel better. I can't really notice your scars. Seriously. If I were looking at your face the first thing that I would notice wouldn't be your scars at all. Smile. Well, I would agree that the lighting is not extremely harsh on this picture. This was taken morning today. The red marks you see, are not red marks, but actual hypertrophic scars (raised). When light is tangential from behind, you can see them very clearly. You know it's all in the lighting.. But it is moderate scarring - this is agreed by a derm and two surgeons.